Common paper wasps are social insects, that are common around the outside of homes and in gardens. These slender wasps have long thin wings and are tan with darker bands and some yellow markings on the face. Their paper nests are often seen hanging by a short stalk from eaves, pergola or shrubbery. 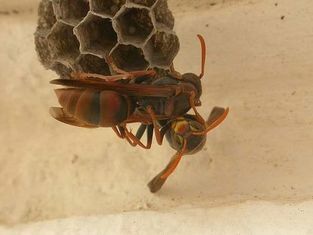 Although they can be pests because of their readiness to sting, paper wasps can also be beneficial in that they are predators of some pest caterpillars. Adult paper wasps feed on nectar. Larvae feed on caterpillars provided by the adults. Paper wasps are social wasps forming small colonies of 12 to 20 individuals. They built a nest out of grey papery material made from chewed up wood fibre and saliva. Nests are often located under eaves, pergolas or in shrubs. The nest is cone-shaped, becoming rounder as more cells are added. The nest has a maximum diameter of 10cm to 12cm with numerous hexagonal cells visible underneath, some of the cells having white caps. An egg laid in each cell which hatches into a grub like larva. The adults feed the larvae on chewed-up caterpillars caught by the adults. The cells are then capped and the larvae pupate inside. Most of the adult paper wasps die in winter, with a few hibernating to start new colonies. Paper wasps are found across southern mainland Australia including southern Queensland, New South Wales, Victoria, South Australia and southern Western Australia. 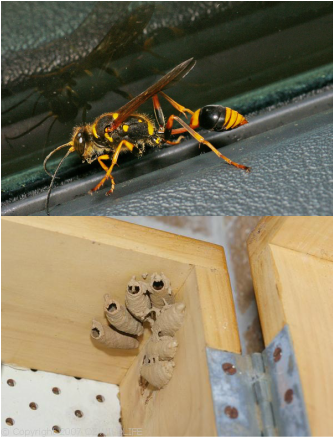 Paper Wasps will readily attack and sting anyone approaching or disturbing their nest. They have a painful sting and will attack any person approaching or disturbing their nest. 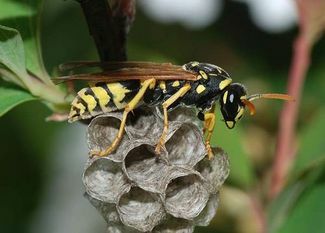 Nests in high traffic areas should be sprayed at night (when the wasps are at rest on the nest) with appropriate insecticide. Nests that are out of reach are not a problem and can be left alone. Generally applying a cold pack to the sting is enough, but seek medical attention if symptoms become more severe or victim has known allergy to stings.. 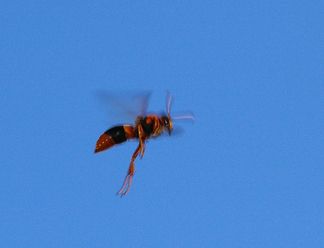 The Potter Wasp is a large wasp. The abdomen is orange and black, and the thorax is black with orange triangle at the shoulders. The antenna and legs are orange-yellow. Potter Wasps are solitary and build a mud pot-shaped nest attached to a tree trunk or side of a building. They can sting but are not aggressive. Females build a mud nest with many cells. She lays an egg inside each cell and encloses a caterpillar in the cell for the developing wasp larva to feed on. The larva pupates in the mud nest and emerges as an adult wasp. The Mud Dauber Wasp is a large black or dark brown wasp, banded with yellow. It has a then waist an long legs. In summer it is often seen around wet soil, pools, bird baths as it collects mud to make its nest. The adult wasp preys on spiders which are packed into each nest cell, then an egg is laid in the cell. The larva eats the spiders when the egg hatches. The female builds a mud nest carrying small pellets of mud from damp soil. Several cells are built next to each other in rows. Nests common around houses in sheds, garages, car ports.